FYI Chris - Snafubar. Vinyl EP. Bleep. Anyone with an eye on British club music over the last couple of years will now be well-versed in the Rhythm Section sound, Bradley Zero’s influential night and label that has backed releases from the likes of Al Dobson Jr. and Hidden Spheres. 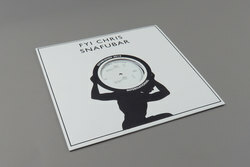 FYI Chris kicks off Snafubar with ‘Russian Woodpecker’, a downbeat techno cut that hinges on a distorted vocal sample, woozy synth chords and meandering sine-wave bass. ‘Repeater’ (not a Fugazi cover) is a mellow sort-of-Balearic slow-burner, and the vibe carries on to side B with ‘How to Ruin the World’. Proceedings finish up somewhere close to where we started - ‘Lone Star’ sounds like a seasick version of ‘Russian Woodpecker’, albeit with more cowbell.